Although, on a more positive note I am happy to share with you the easiest, most delicious fish tacos ever. OK maybe not ever, but these are seriously good. You remember my Secret Recipe Club post for the Mango Avocado Salsa? Well here it is in action. I couldn’t think of a better recipe to use this salsa in. Enjoy the spring weather with these fish tacos and big ol’ margarita; I know I will be. Combine all the spices in a bowl, then coat the swordfish pieces with mixture. Saute the seasoned fish until cooked through (about 5-8 minutes). Steam the tortillas until soft. Fill tortillas with fish, lettuce and salsa to serve. 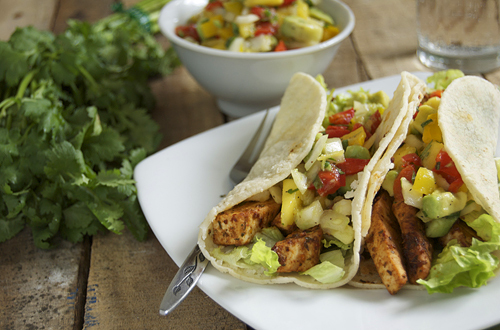 The fish tacos with the avocado salsa look refreshing and delicious! Great photos! Sorry to hear about the urchin, those things are nasty, vinegar’s the best remedy. I always try to wear aqua shoes just to be sure. Ouch. That sounds very painful. Hope you can get them all out and get healed soon. Rest up and take care!! Oh OUCH!!! Sorry you have had a hard day. But yes, these fish tacos with this yummy salsa and a big margarita should make things a bit better!! Oh you poor thing! 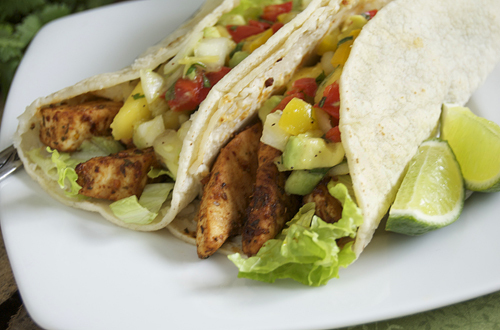 Hope your foot is healing up =) These tacos sound amazing! 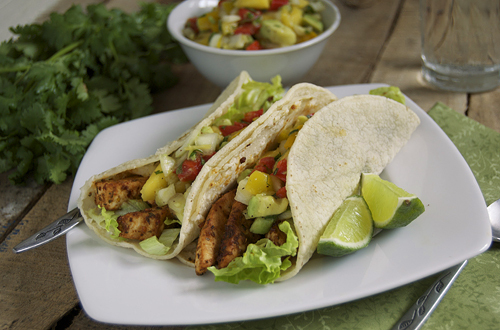 I love swordfish, but never thought to make fish tacos with it – looks like a great summer dish! I hope you had this in your archives before you stepped on that hideous creature! What a terrible experience! I hope your toe is better now. I love a good mango salsa. This looks excellent! Jenny, I liked how you put a positive spin on this post, despite your woes. Your great attitude will help you overcome this latest set-back, and your great Margarita ain’t a bad idea either. 😉 Take care! Ouch, I’ve been stung by a jelly fish. Those sea critters can really hurt! Your tacos look amazing! I didn’t make the mango/avocado salsa as I’d already made a mango/papaya salsa before I found this, but yummm the fish is delicious this way. I may have cut it thinner because it took only 2 minutes on one side and 30 seconds on the other to have perfectly cooked fish. Flavor was outstanding, but spicy so a fruit salsa is really a great way to cool it down.